These dancing robots performed a synchronised dance routine Tokyo, Japan, on Monday. Each Robi is just over 35 centimetres tall and costs almost £1,000. 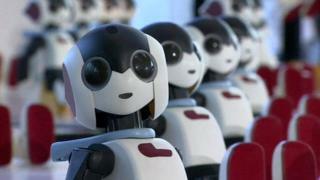 Their creator Tomotaka Takahashi wanted to make a robot that could be mass produced, for a low cost.